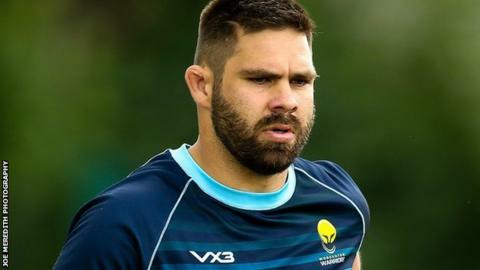 Worcester Warriors director of rugby Alan Solomons says new forward Cornell du Preez's injury in Saturday's home defeat by Wasps was a freak accident. The South Africa-born Scotland international, 27, suffered a fractured larynx in a collision with Wasps and England lock Joe Launchbury's knee. He was initially taken to Worcester Royal Hospital for treatment but has since been transferred to Birmingham. Solomons told BBC Sport: "He was tackled perfectly legitimately". The Warriors boss added: "It was a perfectly legitimate tackle by Dan Robson and he fell to the ground. "Joe Launchbury, who is a really good player and a really good bloke, came across, then fell and it was his knee, from what I could see, which struck Cornell in the throat." The injury, which came just five minutes into Worcester's narrow 21-20 loss to Wasps, has now necessitated a switch to Birmingham's Queen Elizabeth Hospital for further surgery. New Worcester stand-off Duncan Weir was also making his Warriors debut alongside his old Edinburgh and Scotland team-mate. And he says it is testimony to Du Preez's professionalism that he made so little fuss about the injury. "There was no big scene about it," he told BBC Hereford & Worcester. "But then he's just a very hard guy. Probably the hardest man I've ever played with, or against. "I had no idea what had happened. It was only post-match I'd heard he'd gone to hospital. I didn't know that he'd got injured - or the level of it. "If I'd been struggling to breathe, I'd have been in a right kerfuffle. But he was calm and collected. He just walked off knowing he needed help. And that shows the character and hardness of the man. "If that had been me, I'd have been in sheer panic. My toys would would not only have been out of the pram, they'd have been all over the car park." Worcester are yet to offer any estimate of how long Du Preez will be out of rugby - but Weir points out that his old mate has dealt with injury setbacks before. "Sometimes rugby comes second," he added. "He's a good friend of mine from being up in Edinburgh and with the national team. And it's been a funny weekend not knowing what was happening with him. "My phone's being going non-stop with messages of good will from Scotland for him. And my wife has been talking regularly to his partner. "If anyone can deal with it in a positive manner, it's Cornell. He had a horrific leg break injury up in Scotland and you can still see him limping around, but he just knuckles down and carries on training." Alan Solomons and Duncan Weir were talking to BBC Hereford & Worcester sports editor Trevor Owens.